Money Jihad is on extended vacation. Please check back after July 4. Money Jihad posting will resume next week. For 10 years, the blog indexing company Technorati served as the Nielsen ratings equivalent of the blogosphere. But earlier this year, Technorati quietly yanked its rankings of blogs off the Internet and into a dustbin in their server room. 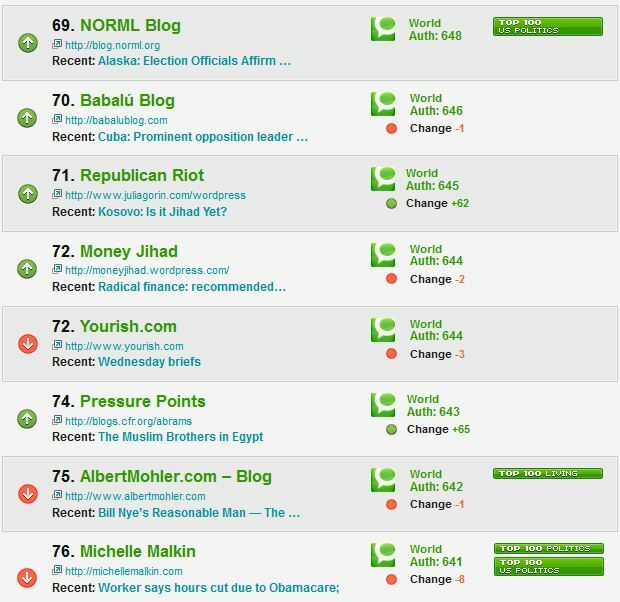 Money Jihad was also listed as a top 500 U.S. politics blog as early as 2010 when readership was much lower than it is today. Alexa, which still provides statistical comparisons of blogs, generally monitors the blogs with the biggest audiences, and scarcely registers accurate metrics for “mid-market” blogs unless you pay them. Money Jihad blog, which is hosted by WordPress, is working great. The Terror Finance Blog (TTFB) however, to which Money Jihad blogger A.D. Kendall is a contributing expert, is experiencing domain problems. TTFB’s editor Ilan Weinglass says the problem may take some time to resolve. The website that has taken over the terrorfinance.org URL calls itself “Terror Finance: tutto sulle opzioni binarie,” The website is in Italian and gives advice on binary trading options. Forbes magazine warns its readers that binary option websites “are gambling sites, pure and simple,” not investment websites. Money Jihad and blogger A.D. Kendall are in no way affiliated with the Italian website. The Terror Finance Blog is technically still available in a basic format at http://terrorfinance.typepad.com/. Pieces written by Kendall for TTFB were cross-published on Money Jihad, and can still be accessed as normal at https://moneyjihad.wordpress.com/category/appearing-at-terror-finance-blog/. Once TTFB finds a more permanent home, we’ll let readers know.